Knock Castle is a rectangular late 14th century stone tower house, founded by the MacLeods. Standing on a steep rocky knoll that juts out into Knock Bay, this headland is possibly the site of Dun Horavaig, an Iron Age fort. Its landward approach is defended by a ditch and along with Dun Scaich, Knock became a Macdonald of Sleat stronghold in the early 15th century. After a rebellion in 1431 it was occupied by the forces of King James I, besieged by Alastair Crotach MacLeod, it was returned to the Macdonalds in 1596. In the late 16th and early 17th century the tower was extended and then remodelled to make it readily available as a royal residence but it was never used as such. Occupied in 1632 but abandoned by 1689, the standing remains are of the main block with a two storey range projecting west at right angles. To the north-west are the turf-covered foundations of a range of buildings and to the north-east at a lower level, are the traces of a long narrow building. 16 miles north-east at Kyleakin is Caisteal Maol. 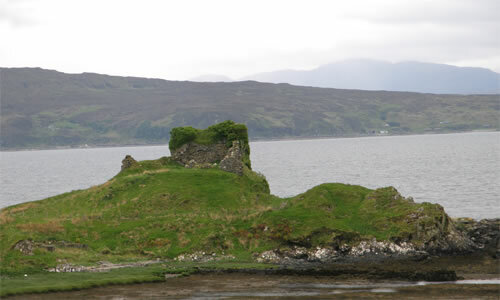 Knock Castle is located on the Isle of Skye, east of Teangue off the A851. 16 miles south-west of Kyle of Lochalsh, on the A87-A851.